Slack is great for communicating with your entire team no regardless of whether you’re in the same room together or working remotely. But if you use a common chat channel to ping your group, there’s a chance that your message will get buried amongst all the others and go unread. Schedul aims to fix that with its handy app. 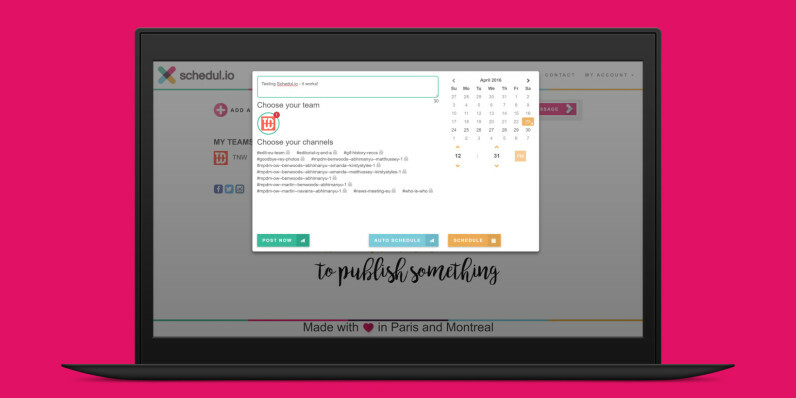 Connect it to your team’s Slack and you can manually schedule a message to be published in any channel at a specific time. The app can also determine the best time to post your message and schedule it automatically; it does so by analyzing your team’s activity to see when most people are online. It’s certainly useful for things like company announcements, team events and birthday reminders. It’s worth noting that this isn’t the first app to offer this service. Convergely offers a bot that let you send scheduled and recurring messages. But Schedul hopes to build on this functionality with things like weekly email digests and support for direct messages. Schedul is free to use for one member in a single team. 5€ (about $5.60) a month will let you add it to 10 teams, and an upcoming enterprise plan will bring statistics into the mix.